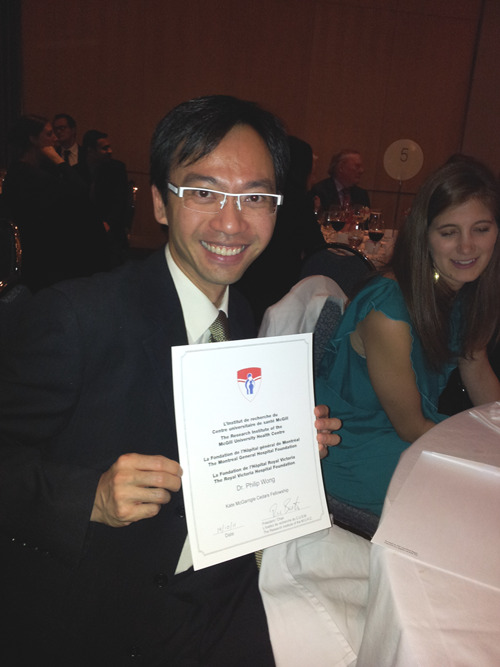 During the MUHC’s annual awards dinner held this past week at Montreal’s Sofitel, Dr. Philip Wong was awarded a fellowship from the Kate McGarrigle Fund / Cedars Foundation of the MUHC. Dr. Wong is in his 2nd year of a sabbatical during which he is doing research into sarcoma at Toronto’s Princess Margaret Hospital. Congratulations Philip.. This is the right stuff. Cheers to the Kate McGarrigle Fund / Cedars Foundation of the MUHC and Dr. Wong. Best wishes to you all in these endeavours!